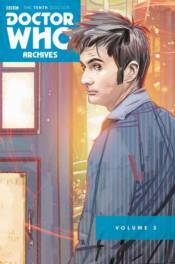 The third Tenth Doctor Archives collects the story arcs 'Tesseract' and 'Final Sacrifice'! Witness the TARDIS assaulted by bizarre, five dimensional beings! Martha and UNIT battling an ancient evil under Greenwich! And, finally, the Tenth Doctor's new companions, Emily Winter and Matthew Finnegan, must face the predations of the Advocate on a war-ravaged alien world - and not everyone will make it out alive! Collects issues originally published by IDW Publishing.